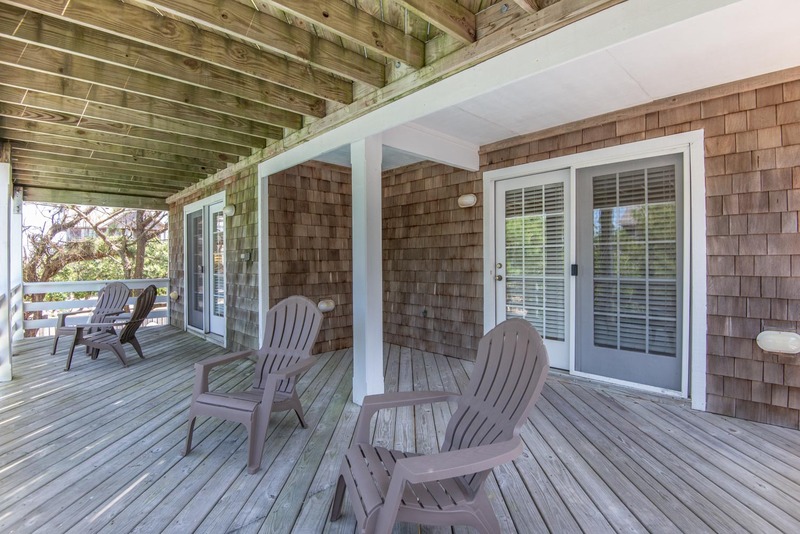 Fantastic views of Jockey's Ridge State Park (the East Coasts Largest Sand Dune) & a short walk to the Beach are just two of the many reasons for choosing this wonderful home for your Outer Banks Vacation. Direct access to the Beach is approximately 200 yards away or just 5 houses from Ocean in a Family Friendly neighborhood known as Old Nags Head Place. This Upscale Home is Beautifully Furnished, Decorated, offers horizon Ocean Views, the Luxury of your own Private Swimming Pool, Hot Tub, & Rec. Room w/Foosball. Upgraded features include hardwood floors, tiled baths, cathedral ceilings, wet bar & multiple decks for relaxing. Ground Level: Parking for 4 Cars, Covered Entry, Rec. Room w/Foosball, Wet Bar w/Mini-Refrigerator, Sitting Area w/TV, Stereo, Queen Sleep Sofa, Half Bath, Access to Private Swimming Pool, Hot Tub, Enclosed Outside Shower, & Park Grill. Mid Level: 4 Bedrooms (Master Suite w/King, TV, & Full Bath w/Jacuzzi, Master Suite w/Queen, TV, & Full Bath, 1 w/Duo Bunk w/Trundle, TV, & DVD, 1 w/2 Singles, & TV), Shared Full Bath, & 2 Covered Decks w/Furniture. Top Level: Beautiful Living/Dining/Kitchen Area w/Hardwood Flooring, Unique Touches, Gas Fireplace, TV, DVD, Stereo, Raised Breakfast Area, Half Bath, Master Suite w/King, TV, & Full Bath, & 2 Sun Decks w/Furniture. Features include: C/AC & Heat, Washer/Dryer, Dishwasher, Microwave, Phone, DirecTV, 7 Flat Screen TVs, DVDs, Stereo w/CD, Wireless Internet, Ceiling Fans, Baby Equipment (High Chair, Pac-n-Play, Booster Seat, & Baby Gates), Deck & Pool Furniture & Basketball Hoop. Next to #408. No Pets. This is a Non-Smoking Unit. Great Place! Nice place with plenty of rooms. Bedrooms and Bathrooms were enough for everyone. Nice short walk to the beach and the kids loved the pool. The house was by far the cleanest we have ever stayed in. The pool issue was resolved quickly and we loved the location and layout of the home. The house was very nice and we enjoyed our stay. We loved the pool, Foosball table, hot tub, and the open kitchen. Having the Direct TV was great - especially with 4 small children wanting to watch TV at 6am!